SENIOR SECTIONALS WERE HELD ON May 14-16, 2010 at the Hilton El Conquistador Golf and Tennis Resort in Tucson, Az. More than 40 teams from USTA Southwest attended the sectionals with eight new champions ready to go to Nationals. Of the eight new champions two are from Southern Arizona Tennis (SAZ). Congratulations to the 3.0 Men’s team from Sun City West and the 3.5 Women’s team from Westward look. These teams will compete in national championships to be held later this year. 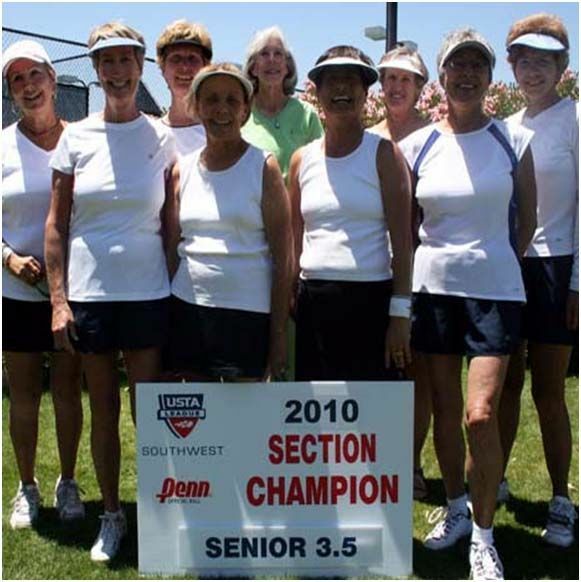 The 2010 USTA League 3.5 Senior National Championships will be taking place October 8 - 10, 2010 at the Indian Wells Tennis Garden in Indian Wells, Calif. More information on this can be found on the USTA Southwest website, click here to get more information. The 2010 USTA League 3.0 Senior National Championships will be taking place October 22 - 24, 2010 at the Indian Wells Tennis Garden in Indian Wells, Calif. More information on this can be found on the USTA Southwest website, click here to get more information.